Thanks to iCloud, it’s easier than ever to sync your contacts and their info from your Mac to your iOS devices, and back. Facebook also allows people to share that contact info with friends, sometimes more than they realize. But the information on Facebook is not always the information you have in your contact book. Facebook users tend to put their birthdays on the social network, as well as other important information, things that tend not to always be in your Address Book. FBContacts steps in as the intermediary. FBContacts works by letting you pull your Facebook friends information and add it into your Mac’s Address Book. The app can pull things like their website url, phone numbers, email addresses, and more. It also allows you to use your friends’ Facebook profile pictures as the picture in your Address Book. Of course for this to work your friends have to be posting reliable information, and not saying they were born in the 1800’s or that their hometown is the bottom of the ocean. If this is the case, FBContacts can pull down that information and add it to your contact information. Fortunately, FBContacts has you covered; from the information FBContacts pulls from Facebook, you can choose which of that is added to your contacts list. That way you don’t have a false birthday listed or don’t want to see everyone’s homepage listed as their Facebook page. A pretty straight forward interface. Of course I’m not willing to show you my Facebook friends. probably shouldn’t have put it on Facebook. That being said, however, FBContacts can only pull the information that you allow your friends to see. This means some of my friends who have more private settings enabled on Facebook won’t have those bits of information synced to me. The second concern is by syncing these contacts from Facebook, your Address Book could unnecessarily huge. This leads me to one of the neat features of FBContacts. The app can scan the names of people your Facebook friends and intelligently match them up with people of the same name in your Mac’s Address Book. That way you don’t risk having duplicate contacts, or having all of your Facebook friends listed in your Mac. After sorting through your Facebook contacts, FBContacts organizes your friends into “Matched”, “Collision”, and “Unmatched”. Matched are all the contacts it was able to match, and unmatched are those contacts that had no listing in your Mac’s Address Book. “Collision” is a handy feature for when some information doesn’t add up about a contact, or FBContacts is unsure about syncing information about a certain contact. From there, you can tell FBContacts whether or not sync a person from any of the three lists, and what info should be synced. FBContacts has to log into Facebook to pull the contact info and scan through them. This of course means that the more friends you have, the longer FBContacts will take to pull all the information. There is another problem regarding how you list people in your own Address Book. I had a few contacts that I only listed by their first name in my Address Book, but I had multiple friends with that same name on Facebook. FBContacts, unless you catch it beforehand, will attempt to sync all the people on Facebook of that name to that one contact on your Mac, creating some confusing when you see one person’s picture when you’re trying to call another person of that name. I did note that I had two contacts with the same first name, we’ll say “Beth”, but I had only attached a last name to one of the “Beth”‘s. FBContacts was able to attach the proper Facebook info to the “Beth” with a last name, and did not attempt to attach it to the other “Beth”, a testament to FBContacts relative intelligence. Also, if your friends don’t have their birth year listed on Facebook, but their birthday or birth month, then FBContacts lists them as being born in the 1600’s. A rather strange, but humorous glitch to be sure. Overall, FBContacts is a good way of keeping information synced between Facebook and your Address Book. While the app doesn’t have an iOS counterpart, iCloud syncing of contacts will allow you to transfer that data between your devices. FBContacts isn’t an app you’re likely to run everyday, or even every week, but good for a sync every once in a while. 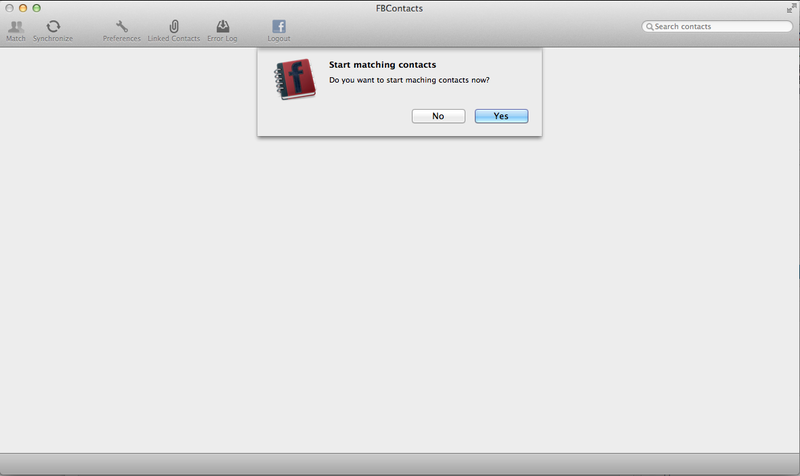 FBContacts is made by Lord Of Software and is available in the Mac App Store for $1.99 (American) and runs on OS 10.6 and higher (Snow Leopard and higher). The iPad 3 has just been announced, and some major changes have been announced. 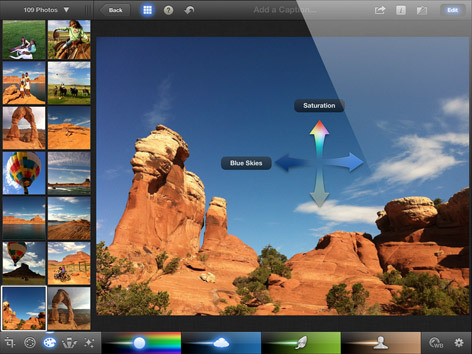 iPhoto for iPad: Apple brought GarageBand and iMovie to the iPad, and now iPhoto joins them. The entire iLife suite has come to the iPad, and the app looks beautiful. Camera: The camera has been updated dramatically. The rear camera is now 5 Megapixels, has improved white balance, automatic face detection, and can shoot 1080p video. This is not as good as the iPhone 4s, but the same level as the iPhone 4. Retina Display: The iPad 3 has a major update to the display, boating over 3 million pixels on the screen, which Apple says is the highest on any mobile device. From initial looks, it looks like a fantastic update, and great for playing high quality games or those new 1080p videos you might be shooting. A5X: The new chip is the A5X, which is a dual core CPU, but a quad-core GPU, meaning that your graphics functionality is going to be vastly improved, which goes great with your iLife suite and new cameras, but for high quality gaming, such as N.O.V.A., Infinity Blade, and more. This could also bring more high intensity games to the iPad, such as what you see on consoles. 4G LTE: AT&T and Verizon will be getting their own 4G LTE enable iPads, starting at $629. No word on Sprint, though I’ll update the article when I find out. Tim Cook, the current CEO of Apple has formerly made comments about the compromises adding 4G would add to the devices, but it seems those statements are in the past. This likely means that the next iPhone will also have 4G. The battery life has only taken down by an hour is 4G is enabled, otherwise it remains at about 10 hours. Dictation: A lot of people were hoping for Siri on the new iPad, but that doesn’t seem to be the case. The iPad 3 comes will the ability to use speech to text, just tap the microphone button on a keyboard to start. However, you can’t use the voice dictation like Siri on the iPad to schedule meetings, reminders, etc. This is something I think will come out in the future, but I’m anxious to get it. You can preorder the iPad at http://store.apple.com/us/browse/home/shop_ipad/family/ipad, and read more at https://www.apple.com/ipad/. The price scheme hasn’t change, 16-Gig WiFi-only starts at $499, and $829 for a 64 Gig 4G iPad. If you have any questions, comments, or suggestions about this or any other topic, leave a comment below or email me at easyosx@live.com You can also check me out on Facebook, Twitter, and YouTube by hitting the buttons on the top of your screen. You can also check out my Google Plus Page at https://plus.google.com/107817518299218190319. Thanks! Today Apple announced the next update to OSX, dubbed Mountain Lion. For the record, they already used this name as “Puma” in OS 10.1, but that is neither here or there. Apple has announced many new features that bring Mac and iOS closer together. Among the apps being brought to OSX are Reminders, Notes, and the Notification Center. First, Reminders and Notes will have their own apps on the Mac and sync directly with your iDevice through those apps. For Reminders, this means you will be able to directly create new reminders from your Mac that will sync to your iDevice, without having to always whip it out for that quick update to your grocery list. Notes will also be leaving the Mail app on Mac to become their own app, a transfer that I believe makes a lot more sense. The new Notes app will also support easy additions of Rich Text formatting, pictures, and allow you to pin notes to your desktop. This may indicate that the Mac’s Sticky Notes App is getting replaced with this new Notes app. Both of these apps look much like their iOS counterparts in terms of design and layout. Lion. With a quick swipe to the left, and you’ll see the whole of Notification Center on the right side of the screen. As more apps integrate with the Notification Center API (Apple apps already will have integrated), you’ll see pop ups in the top right hand corner of your screen as things change, like new Mail, reminders, etc. This is very similar to Growl, but it hopefully means that every time I update an app, I won’t have to worry about breaking Growl (especially Mail). I do wonder how this will affect side-swiping in Mission Control and the use of multiple desktops, but I’m sure Apple will have something for this. In iOS 4, Game Center was introduced as a central hub for players to keep track of all their achievements, compete with friends, and get more out of their gaming experience. This is being brought to Mountain Lion. Not only will Gaming Center keep track of all your achievements and friends lists from your iOS device, there seems to be rumblings that it can integrate with Mac games. The ability to quickly have achievements and high scores in a unified place, whether it be Angry Birds, Sid Meier’s Civilization, or Call of Duty, will bring iOS and Mac closer together. Not only that, but it may also help spur the growth of gaming on the Mac, much has Steam has done. On iOS, there was Messages. On Mac, there was iChat. iChat supported multiple chat protocols like GTalk, AIM, Facebook, and more. Messages on iOS only did text messaging and with iOS 5 it gained iMessage. It was only a matter of time, we believed, that iChat and Messages would finally merge with the advent of iMessage. This comes true with Mountain Lion; Mountain Lion merges iChat on Mac with the iMessage features of iOS. When launching the app, you sign in with your Apple ID to use iMessage, as well as your other chat groups like AIM and GTalk. The interface is now a lot like the iPad version of Messages, with your recent conversations on the side, and the selected conversation on the right. You can also easily share links, pictures, and video by dragging them into Messages. 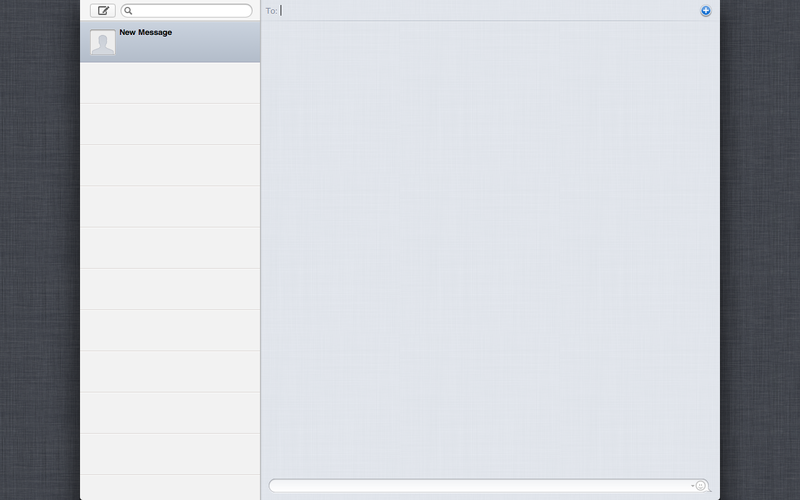 Messages is currently in Beta, so you can download it here: https://www.apple.com/macosx/mountain-lion/messages-beta/. Note that you will have to restart you Mac, and it replaces iChat on your Mac. You will, however, still keep all the other features of iChat, including your other login information for other protocols. Apple has marketed Airplay as a great way to stream media from your iDevice or Mac to any other compatible device on your network. Now Apple has taken a very logical step forward by allowing you to mirror your desktop to any TV connected to an Apple TV. You can then view your desktop, watch movies, give presentations, and more all through your Apple TV. Currently, I don’t know how well this technology works, but for people with small screens, who need a bigger screen for a project, or just to watch a video, this is a step in the right direction. However, it also means to implement this feature, you’ll likely be drawn more into the Apple universe. People like to share stuff, no doubt about that. 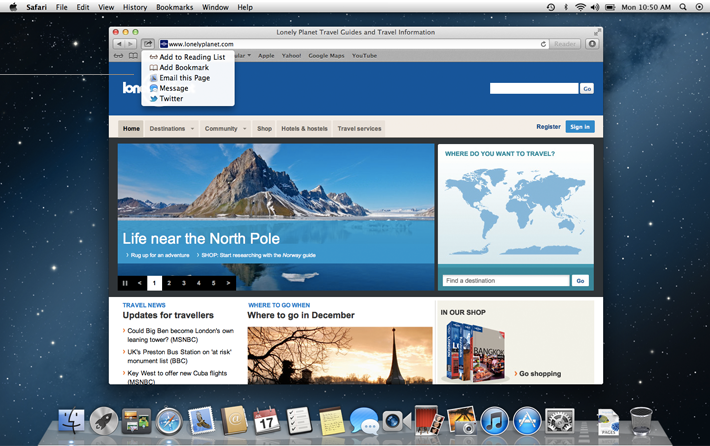 And with Mountain Lion, more social features have been added. With iOS 5, Apple added Twitter integration into iOS, allowing you to quickly tweet photos, links, and more to the world. Apple has added Twitter integration into Mountain Lion too. Sign into Twitter on your Mac and you can easily tweet from your desktop, Safari, and more. If Twitter integration on the Mac is anything like it is on the iPhone, you will likely need to have the official Twitter app installed from the Mac App Store. sites. Having this kind of integration could also mean you will not have to constantly log into said accounts in other apps like iPhoto and iMovie. Having it all in one place could be a big time saver. All of this comes together in what Apple calls Share Sheets. When using Safari on an iDevice, there is the share arrow that allows you to quickly email, bookmarks, or tweet links and media from wherever your are. 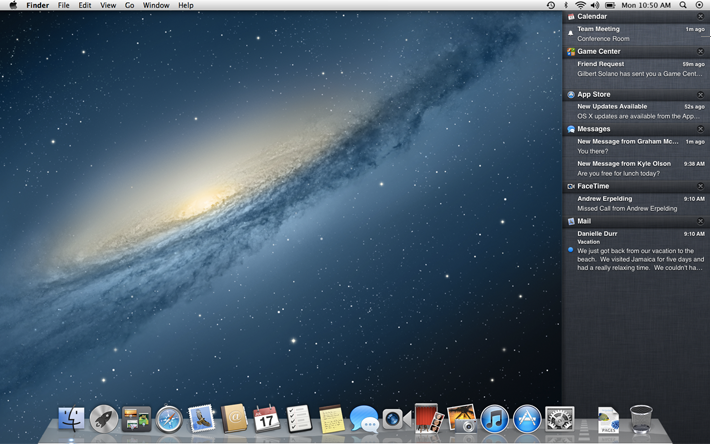 Mountain Lion gets the same abilities in Safari, Photo Booth, and more. Along with the new social media outlets, you can quickly share those links in Safari into Mail, Messages, Twitter, and more. Photo Booth will also have more sharing options, so you can share those crazy pictures of yourself with the world. This feature seems a little more controversial. In lieu of the recent malware attacks, such as MacDefender, Mountain Lion will use a technology Apple is calling Gatekeeper. Gatekeeper allows more control over your Mac by letting you control from what sources your Mac can install apps. At the moment there are three settings: Anywhere, only the Mac App Store, and Mac App Store & Identified Developers. The first one setting is what most Mac users are used to; installing apps from anywhere on the web, whether the apps are in or out of the Mac App Store. The 2nd setting is similar to iOS, where you can only install apps from Apple’s Mac App Store, where they screen apps for quality and security. The last setting means that Apple will be giving special ID’s to software developers outside of the Mac App Store in order make sure they are well-meaning developers (like Mozilla, Google, etc.) and are not malware developers. While this certainly allows for more security, there is the risk of isolating software developers and limiting innovation on the Mac. However the fact that there is a switch allowing you to easily change this option is something no one is complaining about. Lastly, Chinese users are getting a major upgrade to their systems. In the new social features, Apple will be adding popular Chinese site like Tadou video sharing, QQ chat, and Baidu search, among other things. Also a welcome change for Chinese users is better support for Chinese characters, so that reading and writing in Pinyin & Mandarin will be easier, more accurate, and faster. The Developer Preview is has just started and more features are likely to be added as time goes by. I will be giving some of my opinions about some of these topics soon. For now, what do you think? Are you excited for the changes? Angry at the iOS-ification of the Mac? Feel free to share. If you have any questions, comments, or suggestions about this or any other topic, leave a comment below or email me at easyosx@live.com You can also check me out on Facebook, Twitter, and YouTube by hitting the buttons on the top of your screen. You can also check out my Google Plus Page. Thanks! More and more, meetings are being held over the Internet as a cheaper and more efficient way to get projects done and share ideas. Likewise, screen sharing is becoming a greater part of these meetings. And while some apps have screen sharing built-in, such as Skype, they just don’t hold up as well as dedicated screen sharing apps, which tend to cost a bit of cash. So when I need to teach a lesson with screen sharing, I use join.me. Join.me is a free screen sharing solution made by LogMeIn, so the quality of the app is exceptional. To share one’s screen, the presenter must use the free app. Upon launching the app, you are presented with two large buttons: one says “Share” the other “Join”. Hit the share button, and then you can share your screen with anyone by giving them a 9 digit code listed just above the settings. The viewers (you can have up to 250 viewers at a time) can then enter the code on their own app, or go to the website and enter the code in there. Likewise, the code is in the form of a link that you can email or post for anyone to click and view. Note that you can only view from the website, all sharing must be done from the downloaded app. presentation at anytime, as well as share files over the connection, use a text-based chat, switch the presentation between multiple monitors, and more. By upgrading to the Pro version, you also get the ability to switch who’s presenting with one of your viewers, meaning that multiple people can share multiple plans from multiple places. You also get access to international and conference lines, a scheduler, and more. As for problems with the app, they are really minor. The app does not fit the Mac style, but the look is very simple, and still looks great. In this case, I’m glad for a less Mac-ish feel. Plus, this helps it stick out from the other apps, helping to remind me that the app is running. Of course, I can’t forget that it’s running because it sits on top of every window on every desktop on my Mac. While I don’t mind that I always know when it’s running, it doesn’t help that I have to move it if I want to access to a browser tab, a button, a setting, etc. There’s really no way around this, expect maybe to make the window fade into more translucent state when not the selected app. But as I said, this a minor grievance for an app that does its job very well. I would say it needs VOiP capabilities, but those are currently in beta testing. If you’re looking for a cheap yet effective screen sharing solution, give join.me a shot. Join.me is a free app for Mac OS 10.5 and higher, as well as Windows XP and higher. There is an app for iOS and Android, but it only functions as a viewer not as a presenter. It is made by LogMeIn and is available for download at join.me. If you have any questions, comments, or suggestions about this or any other topic, leave a comment below or email me at easyosx@live.com You can also check me out on Facebook, Twitter, and YouTube by hitting the buttons on the top of your screen. You can also check out my Google Plus Page Thanks!